In large microwavable bowl, mix cereal, pretzels and crackers. In 2-cup microwavable measuring cup, microwave butter on High 30 to 40 seconds or until melted. Pour over cereal mixture; stir to distribute thoroughly. Microwave on High 3 to 4 minutes, stirring every minute. Stir in puffcorn. Add popcorn seasoning; toss to coat cereal mixture. Store in airtight container. 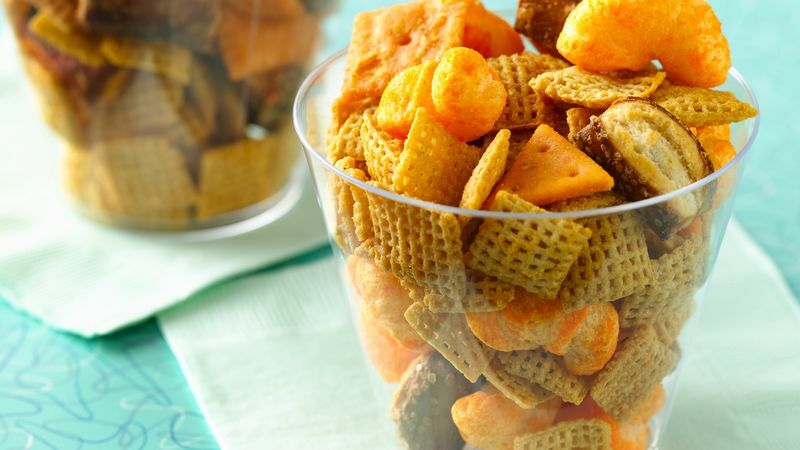 Bite-size cubes of Cheddar cheese would be a great addition to this snack mix.